Buy through MusicWeb from £18.75 postage paid. Immediate delivery. Magazines or websites which review CDs are, I suspect, most commonly read by would-be purchasers interested in acquiring the �best� recording of a piece, or the one which represents �best� value for money. But - sorry, my question is a cliché! - what constitutes �best�? And who is best qualified to say so? Why take my recommendation of a �best� recording of the Bach Cello Suites, against the obviously more trustworthy word of Starker, Fournier, Tortelier, Schiff, Harrell, Kirshbaum, Gendron, Wispelwey or Ma? Which of these (including me!) has thought longest and hardest about this music? I ask this question because, with this impressive new issue, we�re presented with yet another high-ranking recording of this timeless repertory, and comparisons with others are once more the order of the day. But comparisons, even evaluative comparisons, don�t have to result in some sort of batting order; that would be an irksome and ultimately pointless task, given the range of conflicting criteria we necessarily adopt in order to �assess� different versions. Better accept that players and reviewers too have different yardsticks, and often come to different but equally defensible conclusions. Especially in repertory such as this, �truth� (whatever that is) is far from absolute. We can�t even satisfactorily pigeon-hole players according to �school� - say, old-school with modern instrument on the one hand; �authentic� (how I hate that word!) with period instrument on the other. For example, both Casals and Bylsma, poles apart in terms of their playing styles, each adopts a free approach to tempi, dynamics, tone and phrasing: and each exhibits a deeply personal expressive rubato. On the other hand, Rostropovich (an old-timer?) and Jaap Ter Linden (a baroque specialist?) tend to be more objective, more universal, without obvious expressive indulgence, clearly wanting their playing to be a statement on behalf of the composer rather than themselves. Okay, these are oversimplifications: and I�m sure that both Casals and Bylsma share the same ultimate goal of illuminating Bach - and only Bach! Of course anyone keen to duplicate key pieces such as the Bach Cello Suites in their CD collection will usually want contrasting performances: performances which, in one way or another, represent different stylistic approaches - as with a subject being photographed from opposite angles, or in different lights. But a collector who is content with a single CD is more likely to be looking for a safe, middle-of-the-road and hopefully �definitive� performance, rather than anything obviously wayward or untypical. All this is a prelude to considering Meneses, who occupies the middle ground between interpretative extremities. I need to be careful here: adjectives used to describe such performances often imply blandness or monotony - as with a landscape which, however beautiful, lacks easily-distinguishable features. In truth, these readings are anything but bland or monotonous - Meneses speaks with the voice of reason, wisdom and maturity: he won�t provoke you, nor will he disturb you! First things first. 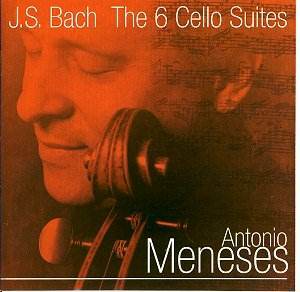 Meneses, his 1840 Jean-Baptiste Vuillaumme cello, the East Woodhay recording location and Simon Fox-Gál (the Avie producer, engineer and editor) combine to produce a truly beautiful and completely believable sound. I feel as though, on my dozen traversals of this set over these past few days, Meneses has been playing specially for me: as though I am his private audience. True, you can hear his every sniff (not too many of these, though, so don�t worry) but you can also hear the subtlest musical detail. The lower strings resonate with a wonderful depth and weight: high fidelity indeed! Seemingly never wanting to be either sidetracked or overly subjective, his tempi tend to be brisk. But a great performer can always shape music without having to create room in order to do so: here, phrases breathe and unfold with a truly vocal conviction. And, in those pieces which encourage expressive extravagance, Meneses resists temptation: and, in so doing, knowing the difference between understatement and overstatement only too well, he simply underlines the point he is trying to make. So, the opening Prelude of the G major may lack the organ-like sustained �chords� implied by its multi-string voicing: but, with more detached bowing than is customary, he allows it to speak to us intimately, to be monodic rather than polyphonic, implied rather than overt. And the great D minor Sarabande is sung with magisterial restraint: no Mahlerian self-indulgence or youthful excesses here! And yet Bach�s Bourrées and Gigues have all the dance-like energy, character and dashing momentum one could possibly want. His playing is impressively accurate. Something we can surely take for granted, you�re probably saying to yourself. Not so! Such are the technical demands of this music, it�s not uncommon to find minor imperfections in intonation, or phrase highpoints where tonal purity is temporarily lost through some momentary excess. Not here! Only in the high-lying tessitura of the D major Suite written for a five-string instrument, but played here - as usual, even these days - on a standard four-string instrument does Meneses ever make you think he�s getting near the edge. Like a peace-maker between rival factions, Meneses plays as if inspired, as if motivated by something bigger than all of us. He brings together a lifetime�s experience of playing and reflecting on this sublime music, and incorporating all the richness and expressive freedom of the �old school� with the more cerebral, intellectually-illuminated thinking of today�s so-called �specialists�. These are enduring performances, which you can live with comfortably. A truly wonderful thing, it deserves the strongest recommendation: buy it, be it your 1st recording, or your nth.